Okay, so that’s a headline we didn’t expect to be writing a few weeks ago, but here we are; January is over and Arsenal arguably go into the second half of the season in better shape than they started the first. 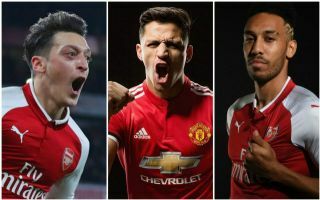 While it’s perfectly possible that one or two of their decisions will still come back to haunt them, for now we believe this has been a perfectly shrewd month of rebuilding by the Gunners, even if it’s not entirely evident until next season. Forgetting all the ins and outs that went on for a moment, the best news of Arsenal’s transfer window may have actually come the day after it closed, as Mesut Ozil’s new contract was confirmed by the club. The Germany international was still being linked by the Independent as a target for Manchester United alongside Alexis Sanchez, but the Gunners held firm to keep one of their most important players. Needless to say, losing both to one of their biggest rivals in quick succession would have been hugely damaging for Arsenal’s morale, as well as potentially awful business for the club if they’d lost him when his previous contract was due to expire in the summer. Ozil’s recent form has reminded the haters why he’s so important to Arsene Wenger’s team, so Gooners are rightly jubilant that this major deal could be struck after being made to sweat over it in recent months as that contract remained unsigned. Amidst all the Sanchez madness it’s easy to overlook the fact that Arsenal signed one of Europe’s top attacking midfielders for absolutely nothing. Arriving as part of the Sanchez deal, Henrikh Mkhitaryan is now a Gunner and he’s finally at a club where he can display the kind of world class talent he’s previously shown himself to be capable of. United and Jose Mourinho never looked a great fit for the Armenian, but playing under Wenger and alongside his old team-mate in Pierre-Emerick Aubameyang could mean the Premier League finally gets to see the player who lit up Borussia Dortmund not so long ago. If BBC Sport are accurate in their estimation that Arsenal paid just £56million for Aubameyang then that’s surely going to be fantastic business. The Gabon international is pretty much the perfect centre-forward – he has pace, strength, he’s good in the air and he guarantees bags of goals if his time at Borussia Dortmund is anything to go by. In an era when less proven players are moving for £100million-plus, it’s quite remarkable Arsenal got hold of this dream Sanchez replacement for so cheap – and in the middle of the season as well. With 141 goals during his time in Germany, it’s hard to imagine the 28-year-old not terrorising defences up and down England as well.